'Is a multi-faceted musician who performs as a soloist, is passionate about chamber music, actively composes, arranges, and records, all while serving as a professor of guitar studies at Fredonia State University. He has performed repertoire that spans a wide historical and stylistic spectrum, from Renaissance lute works to world premieres of 21st Century compositions. His recitals have been heard in Venezuela, the Czech Republic, Hungary, Slovakia, Puerto Rico, Jamaica, Canada, and the United States, including various television and radio broadcasts. As a composer, Piorkowski has written many pieces for guitar, both in solo and in chamber settings, including a large work, "The Greatest of These", for mixed choir and guitar which received it's premiere at the University of the West Indies in Kingston, Jamaica. His works have been published by Mel Bay Publications, Sergio Assad through Editions Henry Lemoine and Clear Note Publications. Of his writing style, Buffalo Magazine wrote, "His music evokes comparisons to jazz icons because of his refusal to adhere to idiomatic pigeon-holing." His recording, Freedom Flight: Guitar Music by Ortiz and Piorkowski, features original compositions for solo guitar, duo guitar, guitar and flute and guitar and voice. The compositions of Ortiz openly display the roots and influences of Puerto Rican culture while the works of Piorkowski are "inspired by Shakespeare, Venezuela, and religious imagery when he sets out to work his magic" -El Nuevo Dia (San Juan). The CD has been summed up as "Great music and wonderful musicians" -American Record Guide. His most recent recording, Sentient Music, features seventeen original solo guitar compositions, including his increasingly popular Sentient Preludes. Critics have called the recording, "an absolutely engrossing collection. "- Buffalo News, "Charming", -American Record Guide, while the esteemed French guitarist/composer Roland Dyens wrote, "Bravo for the CD! You do have your very own world, man – it’s great!" For eighteen years, Piorkowski was a member of the world renowned Buffalo Guitar Quartet, which disbanded in 2000. With the BGQ, he performed in Europe, Russia, South and North America and the Caribbean. The Buffalo Guitar Quartet released four highly acclaimed recordings. One of Piorkowski's compositions, The Struggle of Jacob, was featured on the BGQ's CD, New Music for Four Guitars (New World Records). Guitar Player Magazine wrote that the Buffalo Guitar Quartet was " one of the world's premiere classical guitar ensembles." 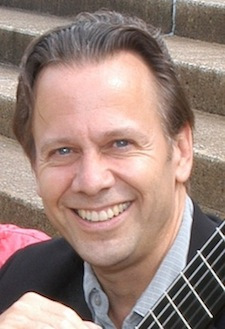 James Piorkowski is a Professor of Music at the Fredonia School of Music, State University of New York, where he has headed the guitar studies program since 1983. In 2006, Piorkowski was the recipient of both the President’s Award for Excellence in Teaching and the Robert W. Kasling Award for Scholarly and Creative Excellence. He was the recipient of the University’s William T. Hagan Young Scholar/Artist Award in 1998.